Ashampoo Uninstaller :: Uninstall programs right and stop Windows® slowdown! Uninstall programs right and stop Windows® slowdown! The longer you use Windows® the slower it gets. Your hardware isn't getting slower - it's Windows® that's getting clogged up. One of the main reasons for this is garbage left over by programs that don't get removed properly. Experienced users have always known the answer to this problem: Ashampoo UnInstaller. It monitors and records program installations and allows you to remove them completely, so that no trace is left. 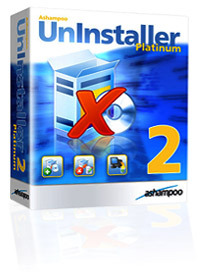 Ashampoo UnInstaller Platinum 2 is the best UnInstaller ever. The Ashampoo UnInstaller series has always been the best and simplest way to keep your computer free of old program garbage. Now it's better than ever, with a whole range of powerful new functions, a slick new user interface and context-sensitive help that gives you the answers you need fast. Like its predecessors, Ashampoo UnInstaller Platinum 2 can switch between Easy Mode and Expert mode. Easy Mode allows you to monitor installations and remove programs with a few simple clicks. Expert Mode provides powerful additional functions for experienced users. Reinstaller - Changed your mind about removing a program? The Reinstaller restores the installation in seconds. Enhanced installer identification - You can now configure the UnInstall Watcher to identify installer programs other than setup.exe or install.exe. Start Menu Cleaner - Lots of programs leave orphaned entries and icons in the Windows® Start menu and on your desktop. This feature clears them. There are two features which set this apart from the average uninstaller: the reinstaller and the start menu monitor. These are two fantastic tools for maintaining and speeding up your system.